Atlas Carbon Products is the world’s leading manufacturer of carbon fibre marine davits and have become the first choice across the industry. Atlas has taken the concept of a crane or ‘gru’ and using the latest technology and materials and a simple but elegant design produced the definitive lifting solution for the boating world. Whether you are lifting jet tenders or dinghies, jetskis or rescue boats, the Atlas carbon davit range will have something to suit your needs. Produced by the world class team at Jeremy Rogers Ltd, well known as the builders of fine yachts, the combination of looks and performance makes Atlas davits the first choice in the superyacht industry. Our exclusive METS-DAME award winning range of lightweight davit cranes have a number of different applications and are currently used all around the world – on dock sides, on superyachts and by the UK Ministry of Defence for man overboard safety. Our full range of davits can be class approved to meet man overboard, man riding and rescue boat launching standard. The Atlas davit is available in a variety of reaches from 1500 – 4000mm. 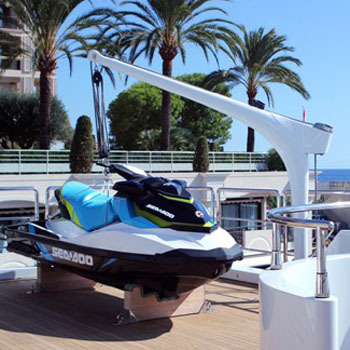 Our davits can be manufactured as a single unit or in two pieces for easier stowage. All standard Atlas davits have a safe working load (SWL) of 500kg. Our range includes the ‘baby’ davit weighing as little as 8kg, with a SWL of 125kg. Multiple sockets in stainless, GRP or aluminium can be ordered, which allows for a single davit to be used in a number of different locations. 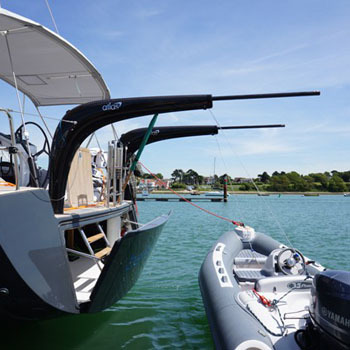 We recognise that each customer has different needs – speak to our team to discuss your individual requirements for davits or any bespoke carbon fibre project. 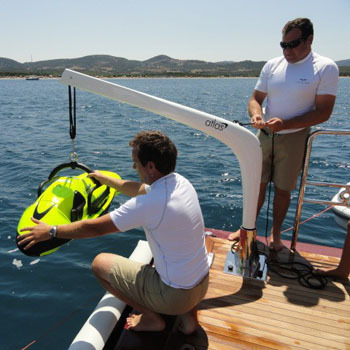 Why choose Atlas Carbon Davits?